We made mention of this one not too long ago but now there’s this flyer and the full bill is made up and everything – so we figured it was worth talking about again to give you all the details. 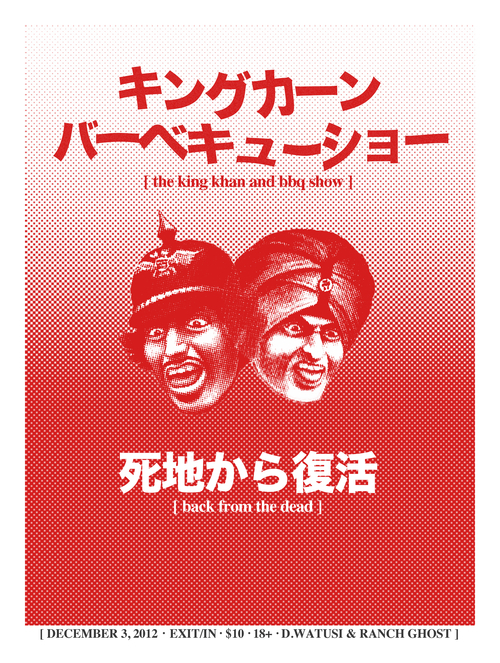 The King Khan & BBQ Show will be back in Nashville on December 3rd alongside D. Watusi and Ranch Ghost. That’s a good looking Monday night if you ask us. You can go ahead and snag your tickets here if that’s your thing. Looks like December 3rd is gonna be a busy night all around town. Promised Land and Hugh Bob playing over at Stone Fox and motherfucking Speedwolf with The Cannomen and Guide over at The Owl Farm. Good shows all around! That’s what we like!